Lucky you- to listen to Charlie Brown Christmas music and work at the same time- that is my favorite holiday movie. Well, that and the grench who stole christmas. Looks as though you are enjoying the holiday season- Merry Christmas to you! Oh I love Charlie Brown Christmas! Fun blog post with many fun things. I too love the Charlie Brown Christmas. The music is wonderful. Oh, now I hear it in my head. The scarf looks Ok but I know how it bugs us when there is a mistake...no one will know but you.I am knitting a scarf now with a pattern but I am doing it random so if I miss count it won't matter! I love our JOY silver decorations from Deb. She is the sweetest. The wool for your scarf is sooo ununusal. It looks very feelable and warm. Your silver joy looks ace. I love it! Christmas memories are sometimes made up of a movie or a song. I think the popcorn scarf is pretty and I am sorry you made it shorter than you wanted! Only you would notice the dropped stitch:) I certainly wouldn't notice it! Have a blessed day dear friend! 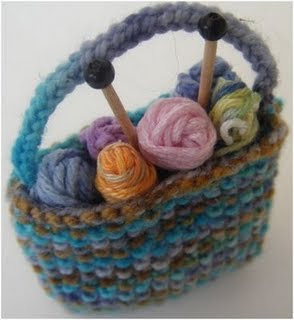 Oooh, thanks for the link to that cute knitting bag -- it's adorable! Hubby loved Charlie Brown Christmas -- it's his favorite show. I love the soundtrack too! I love the Charlie Brown Christmas music, Vince Giraldi(the composer) is a wonderful jazz pianist. By the way...I love the texture of that popcorn scarf...I don't see any mistakes. And the little knitting bag ornament is adorable! !